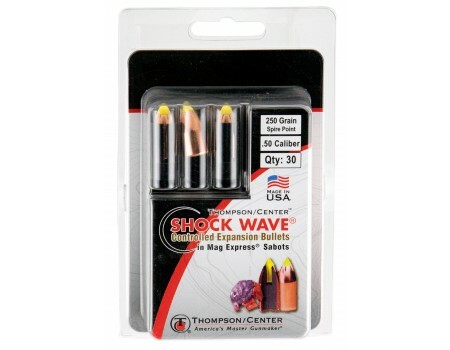 T/C Barrels & Accessories Shock Wave Controlled Expansion Black Powder Ammo. 50 Black Powder, 250 GR, Spire Point. Box price, 30 Rounds/Box. T/C's Shock Wave Controlled Expansion projectiles feature a precision spire point bullet with a polymer tip for muzzleloaders. The polymer tip increases the ballistic coefficient for sustained high velocity down range, and it punches into the pocket to open up the nose cone for fast expansion. Shock Wave bullets have 3" less drop at 200 yards, and devastating energy at velocities of 1000-2200 fps. The harder lead core with interlocked jacket walls offer maximum weight retention and expansion. The Mag Express sabots are designed for easy loading, top velocity, and rapid separation from the projectile for less drag of the sabot, resulting in superior accuracy. This model includes 15 each: Mag Express sabots and Shock Wave Controlled Expansion 45 Caliber, 200 GR bullets.